Happy new year everyone! Thank you for coming back to Time for English. Kaori and I are truly happy to have you with us again. I’d like to start off the new year by talking about New Year’s resolutions as we always do. Now, what is a New Year’s resolution to begin with? A New Year’s resolution is a promise that you make to yourself to start doing something good or stop doing something bad on the first day of the year. Popular goals include resolutions to eat better, drink less, quit smoking; save money, learn something new; spend more time with family, or these days, spend less time on social media. 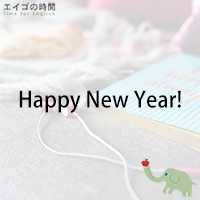 You can make your New Year’s resolutions in English. If you keyword-search for “new year’s resolutions”, you can find a lot of suggestions and interesting ideas. And our goal is of course to continue to help you learn, improve and enjoy English! So stay with us and see you next week.